Fitch Ratings warns that any move to extend debt payments would result in default. Story updated to include analyst comment. NEW YORK ( TheStreet) -- Greek sovereign bonds received another blow Friday when Fitch Ratings downgraded the debt on concerns over the government's restructuring plans. Fitch cut Greece's long-term default ratings three notches from "BB+" to "B+", and placed the bonds on a negative credit watch citing the "challenge facing Greece in implementing a radical fiscal and structural reform programme" necessary to keep that government solvent and create an economic recovery. 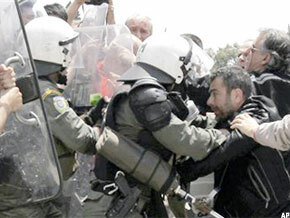 Protesters crash with riot police outside the Greek Parliament. "The 'B+' rating incorporates Fitch's expectation that substantial new money will be provided to Greece by the European Union and the International Monetary Fund and that Greek sovereign bonds will not be subject to a 'soft restructuring' or 're-profiling'," the ratings agency said. Markets have been debating the future of Greek bonds, suggesting that EU or local officials would push forward with a "soft" restructuring of its debt burden by extending the maturity of some notes and affording more time for repayment. The Fitch move seems to have blunted those plans, with the credit analysts arguing that unilaterally allowing for more time for repayment would have catastrophic consequences for the Hellenic state. "An extension of the maturity of existing bonds would be considered by Fitch to be a default event and Greece and its obligations would be rated accordingly," the note says. However, the threat of default by Fitch may not be as dire as it sounds, explains Adam Lerrick, a scholar at the American Enterprise Institute in Washington D.C. If Greece and the EU can strike a deal with bondholders over extending maturities, than the rating agencies would keep the bonds in "selective default" only until new notes are issued. "As long as Greece keeps paying, a selective default rating will assigned for only a matter of days," Lerrick explains. "The government could actually come out of selective default with a better credit rating than before the reprofiling began." Lerrick said this process was used to restructure Uruguay's debt in 2003. Fitch added that it would closely watch negotiations between the EU and IMF and threatened further ratings action if an agreement was not sealed. "In the absence of a fully funded and credible EU-IMF programme, the rating would likely fall into the 'CCC' category indicating that a Greek sovereign debt default was highly likely," Fitch added.